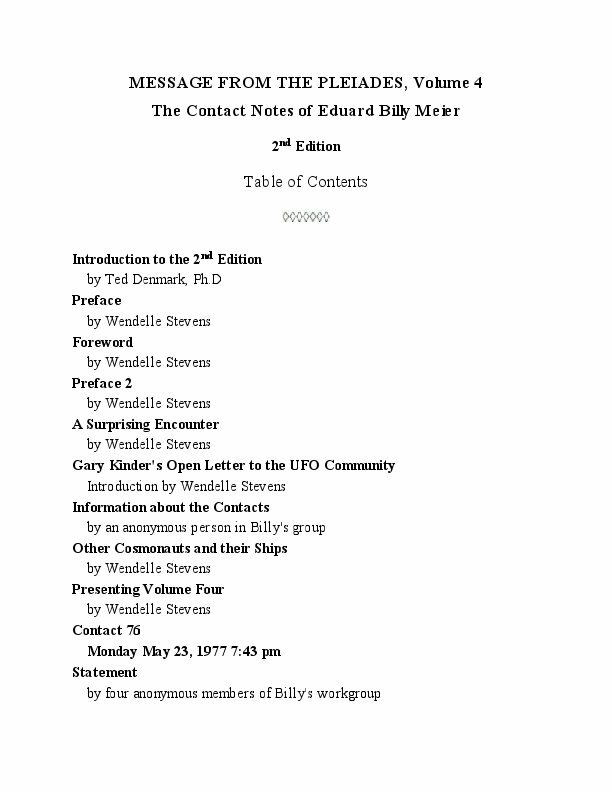 This is the final volume in the series of contact notes of Swiss farmer Eduard "Billy" Meier in a newly edited 30th anniversary 2nd edition, completely revisioned and rewritten by editor Denmark with numerous color photos of the ET Pleiadian "beamships" taken by Meier substituted for the black and white versions in the original. This is the first re-publication in English of the original classic Swiss German contact reports, out of print for more than 30 years with expanded introduction, appendices and notes. The 2nd edition ebook series is dedicated to the memory of Wendelle Stevens, "dean of American UFO studies," and publisher of the first print book edition. 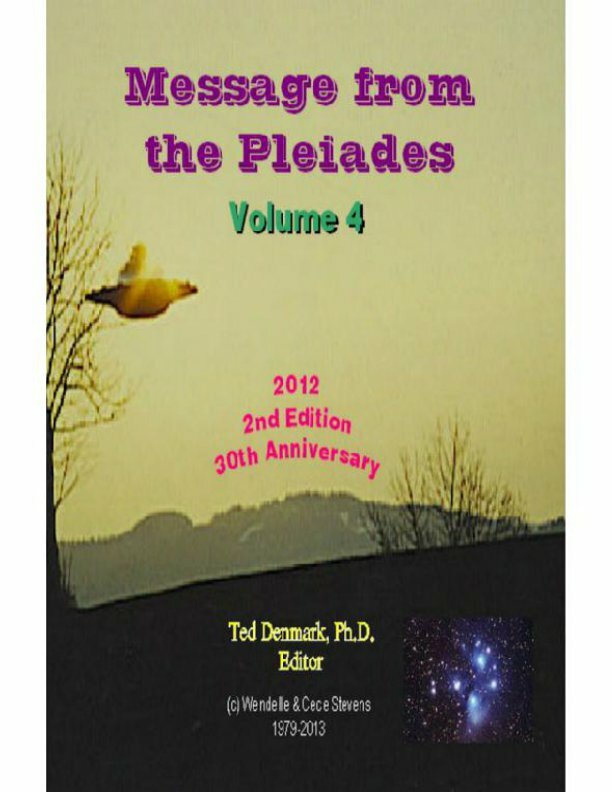 Message from the Pleiades, Volume 4, 2nd ed., Ted Denmark, Ph.D., editor, copyright Wendelle Stevens and Cece Stevens, Hemet, CA, 2013 (original limited edition print book publication, copyright by Wendelle Stevens, Tucson, AZ, 1979). Although this is the final volume of material given by Eduard Meier to Wendelle Stevens—offered and compensated—for the first English language edition of these early Contact Notes, the contacts themselves go for several hundred more, cast in “blocks” in the continuing native Swiss-German publication series done by Meier and his residential “core group.” They are as amazing and astonishing as these first 106 contacts, but, for the participants, it would become a new world of more familiar habits and decreased expectations. This final sequence of early contacts for Volume 4 sets the stage for that transition to come while establishing a powerful and poignant narrative that will remain at subtext level for the duration of a very touching story. 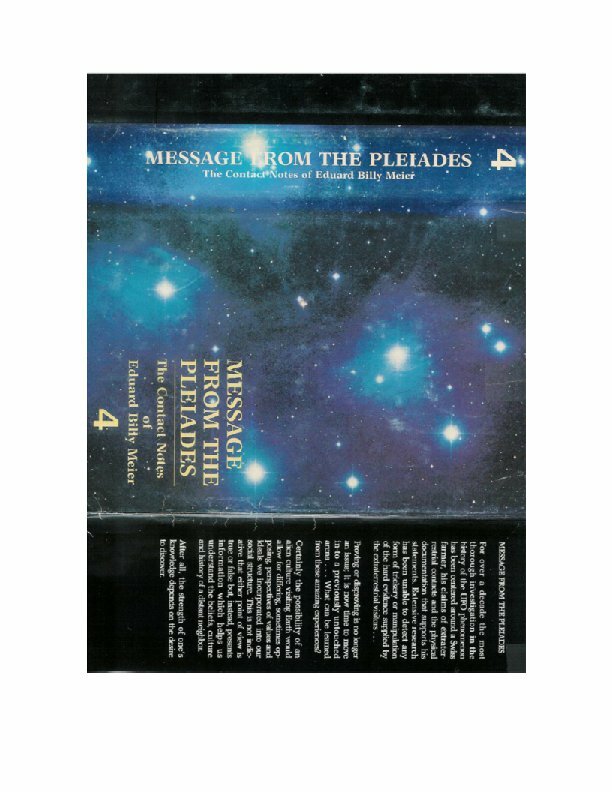 The first reported Contact 76 between Eduard “Billy” Meier and his Pleiadian collaborators, did not begin until page 64 of this final Volume 4 in Wendelle Stevens’ original limited-edition, small-press book, Message from the Pleiades, before which he appears to have placed nearly all his strongest remaining materials of an introductory or supplementary nature yet to be presented, before starting up this final remaining series of contact reports. Perhaps he felt his readers still needed as much additional preparation for the encounter with this final volume as could be mustered, even after getting through the first three volumes—no small chore for him or us—and he was likely right. 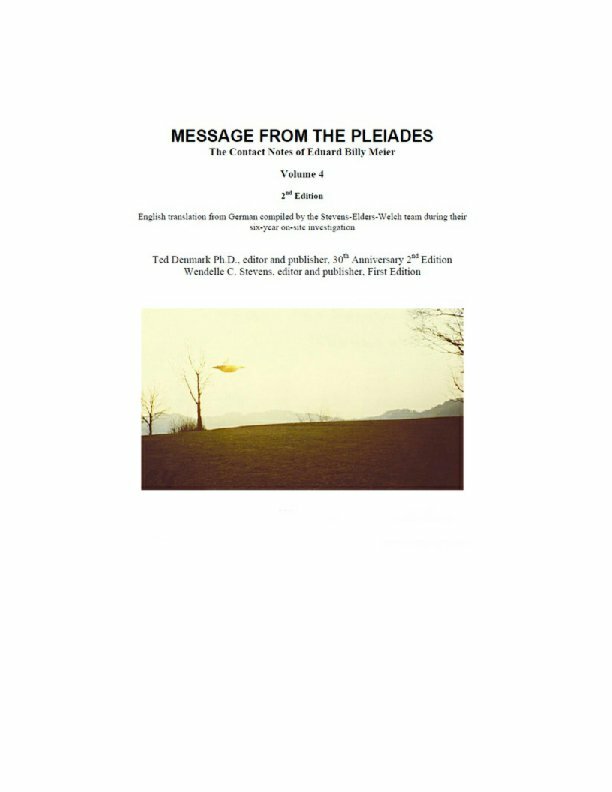 These introductory pieces he lined up to help present this Billy Meier dilemma once again, do offer impressive additional supporting evidence for the authenticity of his contactee experiences pushed to the limit as they are described once again in verbatim transcripts telepathically re-transmitted by Pleiadian technology to Billy, which he then types out afterwards in his study all at once on his typewriter (more recently, his computer!) in his rapid-fire one-handed fashion. 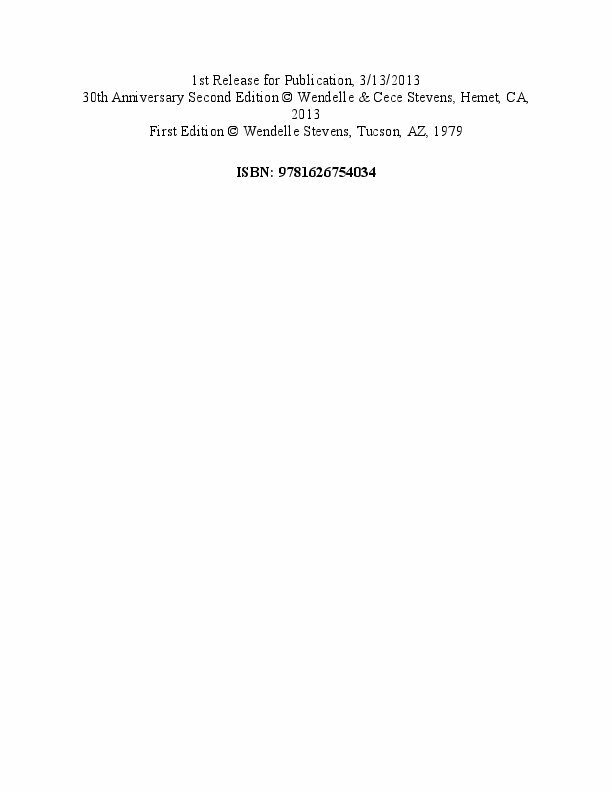 This continuing story, as presented in the now completed four volume effort, remained for Wendelle up until his sad ending in 2011, the most compelling and controversial contactee story he had ever discovered in all his years of investigative travels, giving this “case” its likely finalized status, then as now, as the “jewel in the crown,” the most extraordinary contactee story of modern times. The 1995 copyright listed on the title page of Volume 4 makes us realize that this final volume appeared more than twenty years after the events recounted in the first volume of the series, which started in January of 1975. A lot happened during those intervening years in the various UFO communities, which had become quite polarized over the Meier case, as multiple assassination attempts were made on his life, even after the controversies fell below the public radar and dropped off reports of pending UFO/ET cases. One of the more notably articulate supporters offering a positive take on the Meier case was Gary Kinder with his highly memorable 1987 book Light Years. He, like Wendelle, had traveled to Switzerland multiple times and paid his investigative dues checking out many aspects of the always over-the-top Meier chronicle. And even though there were always more loose ends than he could explain to rank and file skeptics, Kinder made it very clear that Meier seemed to him, fully legit. 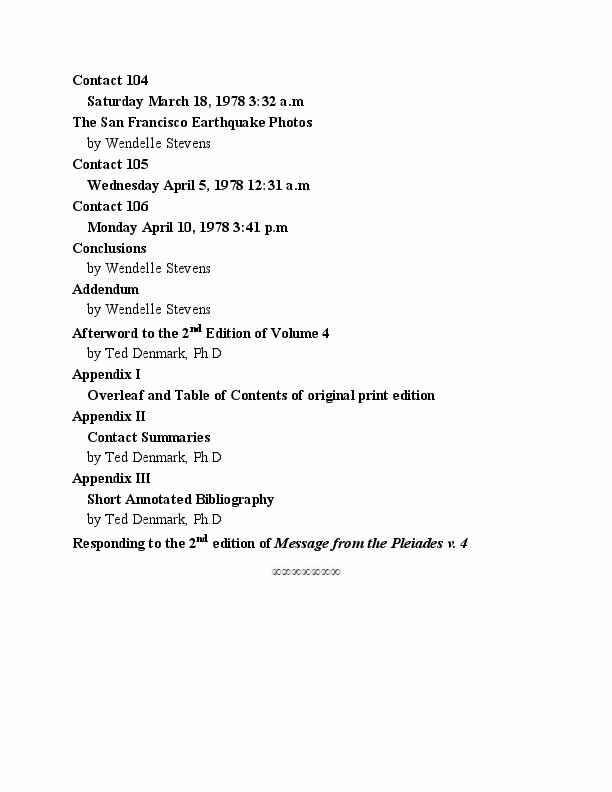 In the longish witness of introductory sections, Wendelle gave a generous space for Kinder’s somewhat famous “Open Letter to the UFO Community” for backup as he sought to persuade the various deniers and detractors who couldn’t figure out what to make of Meier—he just didn’t fit into any of the formulaic movie formats or “made for TV” explainers that they were looking for or could imagine identifying with. And this was the public view of the iceberg—one can only imagine what manner of shenanigans must have been going on in the ufology hornet’s nests, not to mention the “dirty trick” operations of the spy networks. But even before offering the Kinder report, Wendelle went back to document his own unexpected encounter with a woman called “Phobal C.” whom he happened to have met during a public presentation, and who, as a child, had lived in the same ashram in Mehrauli, India where Meier had an extended stay during the time of his earlier contacts with Asket, an ET woman from the Dal Universe (!). 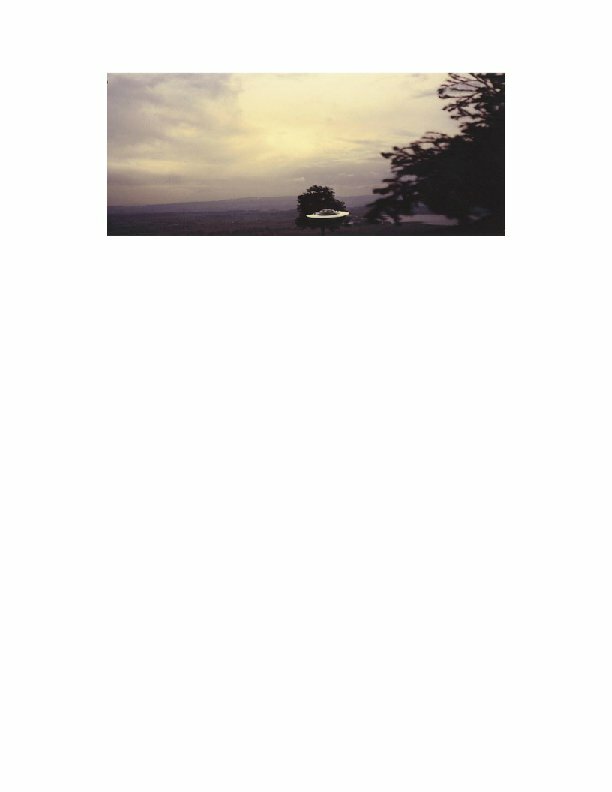 Included are several photos taken by Meier of multiple UFO’s in the sky over that small community dating from the early sixties. All of this would be amazing enough for a separate very “far-out” contactee report in its own right, which it is, but for Meier it was “merely” the second stage of preparation for what would finally lead to his mature mission with the Pleiadians as reported by Wendelle in these books of contact notes as well as various other investigative reports, also mostly authored by Wendelle. The final section of introductory materials, with still more detailed explanations, sketches and photos, is an excerpt taken from Wendelle’s treatise-length 1978 book on Meier called UFO Contact from the Pleiades (both preliminary and supplementary investigations) that was part of his famous series of “UFO Contact” books from around the world. The books themselves have long since been out of print, but the excerpt should give anyone attempting to make sense of the convoluted Meier story additional knowledge about what to make of this high-strangeness story coming from various sources—note that a search for “Billy Meier” on YouTube currently yields more than six thousand multimedia entries (though many are nested duplicates). But more than anything, all this should prove to anyone having an open mind, whether their knowledge is modest or extended, what lengths Wendelle went to in his early attempts to provide an objective, authoritative and unbiased account of what he had found as a participant observer and later personal friend of the very unusual “Swiss farmer” and prophet who has taken his place as one of the most controversial men of the 20th Century and in Century 21, has now become known as “BEAM” (Billy Eduard Albert Meier). The contacts themselves start with a series of ET substitutes for Semjase, who has previously been Billy’s main liaison from the Pleiadian ET group, but beginning in Volume 4, has been away for a months-long, somewhat mysterious interlude. These include Menara, a dark-skinned woman from a world in the Lyrian System who has appeared previously, another Lyrian woman Alena, a friend of hers, and Ptaah, Semjase’s now well-known Jshwsh Space Commander father. The two Lyrians provide quite a lot of interest when they bring an obsolete (for them!) laser pistol for Billy to test fire and allow him to make photos of it while it is held by Alena off camera with only her gold mylar-like jacket sleeve showing. It would become a field day for the skeptics to debunk, but all-together a fascinating outing for Billy and his ET friends as well as for today’s reader. Finally, in the long Contact 79, after the first hundred pages of the original print book have gone by, Semjase appears once more to take up her lead position as Meier’s personal handler, and it will seem like things have finally gotten back to “normal” for a while, and this sense continues with Semjase’s lovely presence until Contact 94—limiting her appearances to only half of the contacts in Volume 4—where she will make her final appearance ... for reasons that would be unfair to reveal at this too-early entry point but which will make up the main theme of this final Volume 4 as surely as the Great Trip to the edge of the Universe marks the culmination of the initial volume of Message from the Pleiades ... almost like book ends. Perhaps it would be safe to say that this final volume of contacts as were first rendered into English by Wendelle’s group of associates and translators, gets into the nitty-gritty of what really happened when a small group of very advanced Pleiadian extraterrestrials attempted to work with a collection of ordinary or in some cases, distressingly wayward, Earthumans and try to carry out a shared mission with only a single person (Billy, of course) common to both groups. Can you guess that it became quite an ordeal for everyone involved? 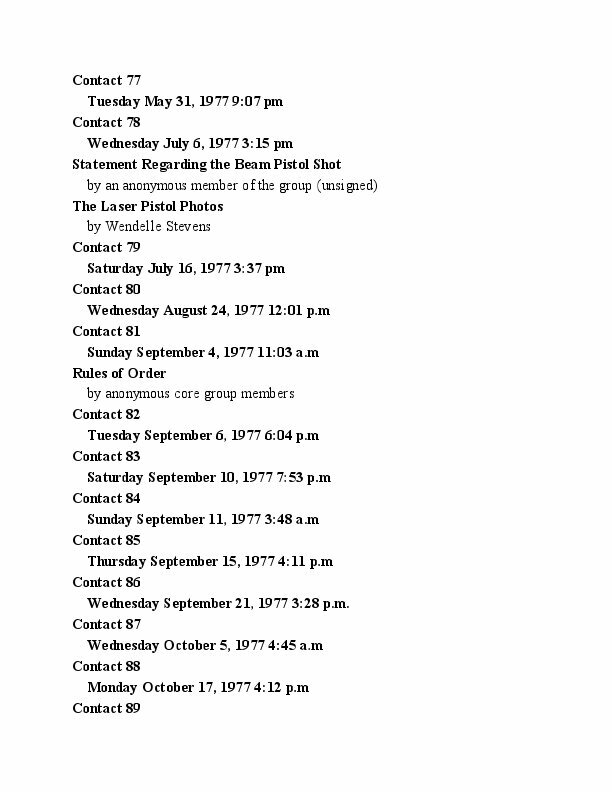 Included here are some of the painful details of the regimen with many actual names and details deleted out, as in the original, for propriety’s sake, but nonetheless with all too many frustrating deletions of the more indiscreet episodes for a sense of continuity that would perhaps have made it more readable … but all those personal references would mean much less now than they did in the day when this was all happening closer to “real time,” so the loss is fairly compensated. But it is hoped that the scenes being re-created here are rendered with as much insight as possible by a core group outsider like myself, now more than thirty years later, critically observing and suitably clarifying the extraordinary immediacy to make it all fit into a contemporary American-English idiom … but it is an eye-opener in any event, and not a tale that anyone could likely have “made up” by fashioning a product of creative fiction as claimed by various (let us dare say it) narrow-minded skeptics with their typically low levels of interest and involvement—if not blatant schemes of disinformation. 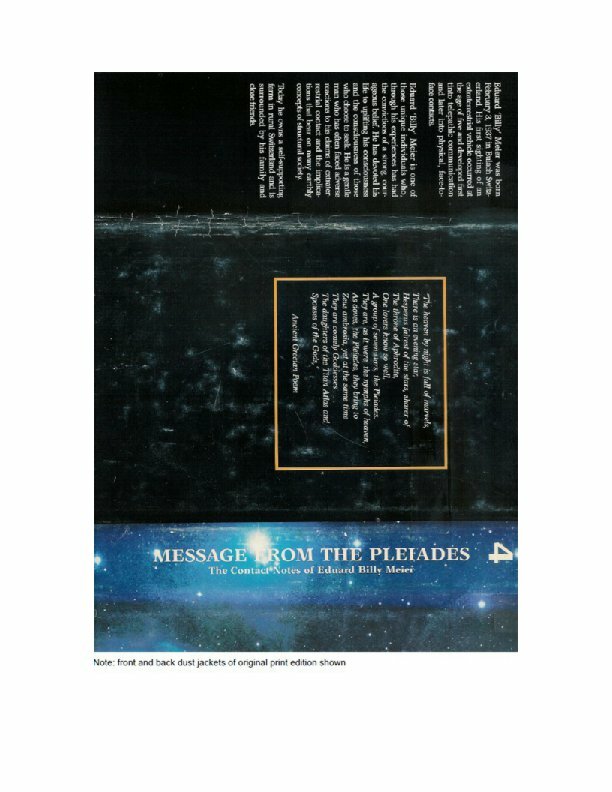 It is rather likely the richest extended authentic documentation of exo-psychology yet publicly discovered—indeed a virtual New Age Testament—which I also feel reasonably sure will eventually be more widely recognized as this field emerges from the shadows, hopefully with added impetus to set a tone with this rejuvenated 2nd edition of Message from the Pleiades. The contact episodes following number 94, the ones without Semjase, though her loss will probably be felt as poignantly as anything yet encountered, reveal fascinating dimensions of Billy, at least somewhat previously hidden, as he interacts in various complex ways with Quetzal, Semjase’s Earth Station Commander, in a more “man-to-man” style for virtually the remainder of the book. Some of it gets a bit tedious, as had the number of deletions in some of the earlier contacts, but nothing has been omitted that was included in the original print book and nothing has been added to the main dialogues that was also not included there (except relief from some of the repetitive tentative English formulations and the addition of a few new notes). Even thirty years later, after all the testimonials, denials and controversies, it is still a story too bizarre to be completely believable either on its still too heavily censored face for nearly anyone, however sympathetic or interested they may be—including myself—though I was convinced of Billy’s veracity early on by the efforts of Wendelle and company. Part of the reason is that some of the story has still been left out in its public presentation … so far (like Billy’s rumored trip with Semjase to her home world Erra!). But any radically alternative detractor explanations involving confusion, deception, delusion, and so forth—or just plain madness—that has surfaced over the years has now been proven to show little creditability, in spite of behaviors of certain core group members, including Kalliope, Billy’s now former wife, so heartily praised in these contacts. The story generates its own wake so we can imagine the stress and strain they all felt. 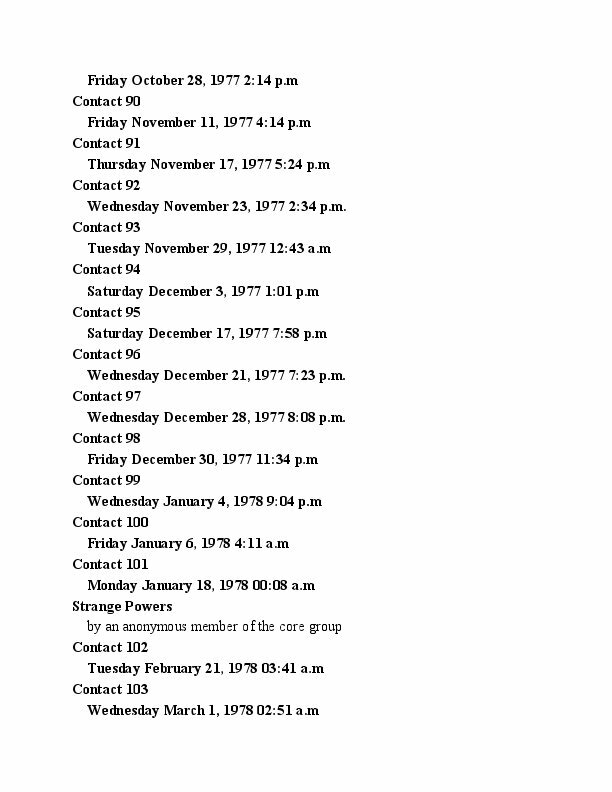 For sympathetic interpreters like myself, who might have also had a series of minor but unique benevolent contactee experiences over a period of decades, these reports still seem “far out,” as they were for Wendelle, but Billy’s long series of contactee experiences are actually unique, and the preponderance of evidence is still on the side of realistic acceptance … unless one is willing to abandon the witness of direct awareness and even reason itself. We all need some time to realize that it is surely a much more complicated universe “out there” as well as “in here” than we can literally possibly imagine, as contemporaries embedded in a civilization yet in its early stages of technological development. But, of course, Earthumans now thriving with Internet smart phones in early Century 21 have already come some way beyond the sensibilities of those punching time cards or the like at the three-quarter mark of last century when the Meier story first broke. And to inject yet another controversial issue (!) into this reprise of the Meier story, it has also been my extraordinary good fortune, as noted previously in earlier volumes, to have been able to communicate with Semjase myself through a gifted trance channel whom I have identified in earlier volumes of MFTP as Julie. I have only added a few specific notes in this regard for MFTP Volume 4 because, as I have had confirmed, Semjase herself still regards the mission with Billy as only a partial success at best (as earlier revealed at some length in Volume 3), and that the extensive if minor censored deletions of the contact notes in Volume 4 were not in need of being filled in at this late date by her. Yet she (and a couple of other Pleiadians with whom we have also succeeded in making contact, who are actually our own paternal family) still supports this attempt to re-publish a corrected and re-interpreted English version to recapitulate the facts of the early Meier contacts as they really happened without so many of the errors and so much of the confusion and obfuscation of Wendelle’s distressed early translation manuscript that so rightly troubled Billy and FIGU. Incidentally, Semjase has also told us through Julie that the Grey Zetans have at least temporarily stopped their abductions, for whatever reason … indicating that the Pleiadians have been well aware of them and their apparently nefarious activities, but were not in a position to have directly challenged their “harvest” that led to only marginally successful hybridization experiments, but evidently were persuasive in having them find other options for helping solve their dire circumstances. So our conclusion, looking over Wendelle’s shoulder for the last time, remains the same: the five graded varieties of ET contact, starting with brief sightings with or without fleeting pictures, up to collaborative “contacts of the 5th kind” of which the Meier case is probably still the most dramatic … are real, in spite of fakery and flakery on the sidelines—and will eventually become part of our mainstream Earthuman cultural heritage once again, as we go deeper into what is now being called the Disclosure Era. The last volume of these Meier chronicles, this most extraordinary tale with all its various emergencies among time travels, laser pistols and overwrought psychological extremes, is now complete and ready to find its new readership. Only time will tell what the outcome will be—and it could take quite a lot longer than any person living today will be able to grasp or understand. And oh, BTW, the next hundred or so Meier Contact Reports after these first 106, are already available in a very nice English translation if you will only make a modest effort to search for them on the Internet. And hopefully, eventually … all the “blocks” of them now only auf Deutsch … will appear in numerous languages, for which we give thanks for all the various efforts being made. But now let us get on to what I hope will be, for the majority of readers and open-minded thinkers and investigators … a most uniquely interesting and compelling experience that defies categorization (!). Ted Denmark, currently residing in the California Motherlode, has lived in Northern California for most of the last 50 years. He attended Rice University for B.A. (Philosophy), studied Jungian psychology in Zurich Switzerland and attended graduate school at UC Berkeley where he received his Ph.D. in Developmental Psychology in 1975. He worked at UCB Space Sciences Lab as a design engineer for several decades before becoming a computer software engineer at Autodesk. He later taught computer science as an adjunct instructor at Columbia College in Columbia, CA. His interests include organic gardening, solar architecture, astrology, ballroom dancing and a wide array of scientific and esoteric studies. His current retirement career as a writer has been primarily focused on exploring and writing about his and other's contactee experiences over the course of his lifetime.